A full breakdown of what we learned at the premier elite regular season event on the college women's calendar. The article is presented by VC ULT Camp; all opinions are those of the author. Please support the brands that make Ultiworld possible and participate in VC ULT Camp! 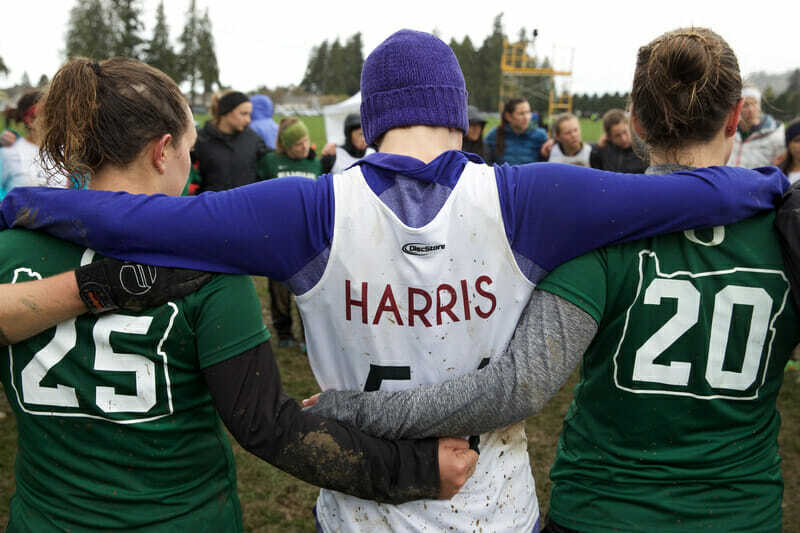 In its third year, the Northwest Challenge is still deciding what it wants to be: is it an elite tournament where the best women’s teams can have a near-Nationals experience? Is it a destination for non-NW regions to try to earn bids against the best? Can it be a great men’s tournament, too? Every year organizers adjust the tournament format and their own approach slightly as they try to land on a lasting identity. The quality of talent the Northwest Challenge attracts hasn’t changed, however. Last year’s semifinalists had all met earlier at the Northwest Challenge, and 7 of the 8 quarterfinalists had been in Puyallup, too. That means what we learned at NWC is going to be crucial to how the postseason plays out. There are a lot of uncontrollables you can plan for: Oregon knew they would only have 12 players in their rotation for the weekend and they knew they would be without strong presences like Hayley Wahlroos and Alex Ode. But they didn’t plan for grand theft auto. When someone stole Oregon’s team van on Friday, they robbed Fugue of their disc bag and their boom box as well. Oregon was missing their emotional support as well as their physical. These obstacles became strengths for the Eugene crew. Injured players and coaches flanked Oregon’s warm-ups to supply the energy and motivation their boom box usually offered. They kept timeouts positive and productive during close games. And they pushed Oregon’s stars to grit through the toughest points. Oregon ran right over the competition. Ella Hansen and Bethany Kaylor were often two of the most productive players on the field. They went 7-0 and became the Northwest Challenge champions with a 15-12 win over regional rivals UBC. Fugue took what they could control and made themselves #1. The Lady Sweets of Whitman entered the tournament healthy and confident after a Stanford Invite championship victory, but, midway through Saturday, veteran and dynamic cutter Claire Revere was sidelined for the rest of the tournament after an injury. Revere is a key cog in the Whitman offense: a true mid with elite speed that has the disc skills to primarily work underneath and keep the disc moving, gaining large chunks of yards and frequently continuing downfield. Without her presence, the Whitman offense’s distribution of talent lays heavily in the handler position in Margo Heffron, Nina Finley, Ari Lozano, and Alex Hardesty. Each has great handling abilities, but when they all take to the same line, the offense gets a bit clunky. None of the three prefer to work downfield, so their abilities are self-contained to swings and resets. Other cutters can’t produce the same flow and pace that Revere can, but they do find success deep if they can find good timing with the constant swings. But this weekend, with Revere (and eventually cutter Alissa Soo) out, teams exposed Whitman’s Achilles’ heel. Whitman’s handler resets were inconsistent all weekend, and when elite teams like Stanford and Oregon clamped down, their backfield choked. Players with the disc would look back, fail to find open options, and either throw into defenders or punt the disc. Whitman eventually made adjustments, but they came far too late in their game against Oregon. There are a lot of good reasons Whitman walked into the weekend as the #1 ranked team in the division, though. Their roster has a small army of Seattle youth talent who have been well covered by this point, and this core has had several seasons with coaches Ben McGinn and Jeremy Norden to cultivate an effective playing style. Whitman is fast, skilled, and smart. We saw flashes of great cutting from Marlena Sloss and Brenna Bailey in lieu of their more well-known teammates. The Sweets are a top five team, even if they’re no longer at the head of the class. The Northwest Challenge is designed to highlight granular issues like these, and it’s part of why the best teams attend. With a high ceiling, Whitman can afford to workshop solutions in Burlington, WA, instead of in Raleigh, NC. British Columbia has been deep in recent seasons and had top talent, as well. It’s been one of the team’s strengths. But how they are utilizing their personnel has changed under the guidance of new coach Jeff Cruickshank. “He finds what individuals are good at and makes use of that skill rather than seeing that a player has a deficit in one area and writes them off,” Thunderbirds captain Mira Donaldson told Ultiworld. Not a lot of teams have a rookie and a sophomore they can put one on one against one of the division’s most unmanageable cutters. Not a lot of coaches would even try it. But Cruickshank and assistant coach Candice Chan identified the speed of second-year Naomi Morcilla last year and the footwork and quickness of freshman Paige Muir, and how those characteristics balanced the matchup with Oregon’s Jesse Shofner. And then they built a team concept around that. Meanwhile, the offense has diversified. While British Columbia still loves their isolation sets, they showed off greater offensive flexibility and more varied contributors. That’s just two examples of what the minds in Vancouver are working on for the UBC ladies. But all the intelligence – and culture building, which they have done a lot of – won’t help you if you can’t complete passes. That’s the catch…or lack thereof. UBC’s execution leaves plenty to be desired and there isn’t a lot of time left to figure it out. Having a roster full of former Canadian U19 and U23 players should help hasten the process of adding polish to what appears to be a strong framework. Out of region teams don’t historically succeed at Northwest Challenge – unless they come from the Ohio Valley, apparently – but they travel to the country’s upper left anyway because they get to cut their teeth against the best. Last weekend, Pittsburgh proved mentally ready to be an elite team, even if their game isn’t quite there yet. Pittsburgh fought to break six times in the second half of their game with Western Washington to win 15-14. While the win would be their last of the weekend, their two point loss to UBC and their one point loss to Whitman reveal a team that doesn’t know how to give up. At their best, Pitt pushes the pace of the game with low-stall possessions and regular breakaway cuts deep for Carolyn Normile’s hucks. Linda Morse made her presence known downfield; at times she seemed to be the only option for handlers. Pittsburgh didn’t have the bench to address elite threats like Kaylor or Donaldson, but they are well coached and know how to fight. Count on watching Carolyn Normile and Linda Morse at Nationals in May. As evidenced by their play in Washington, you can’t count them out. Spectators can count on Monisha White’s aggressive hucks, Anne Rempel’s savvy downfield defense, and the Superfly zone. But this Northwest Challenge produced a pleasant surprise: Stanford’s sophomore class is stepping up. Players who saw few minutes last season are making an impact this year. From Michelle McGhee to Freya Chay to developing defensive stud Shayla Harris, Stanford proved their depth this weekend. This depth isn’t all prepackaged youth talent; it’s development. Among all Stanford’s second year players, one stands above the rest, literally and figuratively: Courtney Gegg. In her second year of graduate school, Gegg has quickly grown into the highest impact player on the team. She may be one of the toughest matchups in the division. White, Rempel, and freshman Hallie Dunham looked for Gegg deep every time she played. Defenders forced her under, and she would punish them with long continues off her open cut. Gegg’s play already defines Stanford’s game, and with years of eligibility left, she will be a big part of their future. Superfly runs a pretty small rotation and asks every player to make significant contributions. Whether you’re a veteran handler like White, a new grad student like Anne Marie Gordon, or a second year just getting significant minutes, you are expected to come in and execute for Stanford. It greatly enhances their individual development and team chemistry, but leaves them susceptible to injuries, which have weakened them at more than one Northwest Challenge. Though it would require some upsets, if healthy, a return to the National Championship game is not out of reach. Chaos of Western Washington lived up to their name, even if their results didn’t lead to it in the standings. Led by handler stars Tiffany Phan (coming off an ACL injury), Abbie Abramovich, Samiya Ismail, and Michelle Hanneman, Chaos started off by nearly knocking off Stanford after going down 0-2. WWU’s handlers finally got over their nerves and settled in, making swift throws and not allowing the Superfly defensive zone to set. Making their way downfield through this up-tempo pace allowed downfield cutters Maddie Gilbert and Jesse Thoreson to make miraculous diving catches down that ended crucial points in favor of WWU. They fed off their positive energy throughout the entire game, but fell short 13-14. Not bad, though, against the reigning National runner-up. Western Washington went 1-3 in pool play, but did so with gusto. Their losses came against opponents all ranked higher in their pool: Pitt (14-15), UBC (10-15), and Stanford (13-14). Chaos can clearly keep up with the top teams in the country. Western was actually up 14-11 over Pitt late in the game and looked onto the way to a quality upset, but gave away the last points due to self-inflicted wounds. Their biggest win, however, will be in the rankings. Chaos ensured they’ll claim a fifth bid for the Northwest region with their performance over the course of the tournament. That makes a return to Nationals likely, where perhaps they can complete the type of upsets they made some runs at this weekend. Washington Element plays a very distinct style of offense: weaving handler movement that eventually transitions into high percentage power position hucks. After a score, they have multiple defensive looks to throw at teams before storming the disc on a turnover and looking for fast break opportunities wherever they can find them. The recipe isn’t complicated, even if the execution is quite. While maybe not the most efficient strategy, we’ve seen this system score in high volume against many of the nation’s best teams, including an 8-4 run in the first half against UBC on Saturday. The style is hard to maintain over the course of an entire game, which can allow teams to adjust and recover, just as UBC did in that same game, storming back to defeat Element 15-13. Washington’s weekend went mostly as expected: they lost to higher seeded teams, and beat the lower seeded teams. A close finish with UBC and a solid five point win over Pittsburgh nudges them firmly into “good weekend” status. Streaky teams like this are hard to place high Nationals hopes on, but it is safe to say that this Washington team can steal a game from anyone in the country, and could very likely end a title-favorite’s tournament. Carleton ultimate has been an institution for so long that we don’t typically use the term “rebuilding” for their teams, no matter who they graduate. But this is a rebuilding year for Carleton. 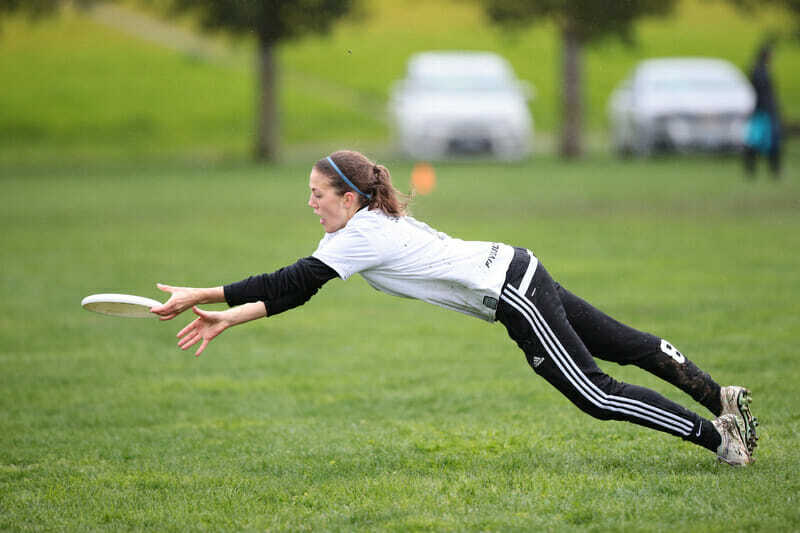 Carleton Syzygy went 1-6 this weekend with a 15-14 win over Victoria as the only green in their ledger. The team is young, and it shows. All the athleticism and willpower in the world can’t substitute for knowing how to clear a lane or when to turn the page during a cut. Even though there is talent, the team sometimes plays with a rookie’s reticence. The North Central has one bid and many capable contenders; the regional defending champions have never looked more vulnerable. Yet if Syzygy’s semifinal run last year taught us anything about this long-running program, it’s that we should never, ever count them out. If the trend wasn’t apparent to you, most teams had at least two players uncleated on the sidelines by the end of the weekend. From twisted ankles to hard hits and concussions, personnel on and off the field were warping the games. For some, the missing playmakers were noticable: you could tell gameplans were missing pieces. A pared down role for Claire Revere on Saturday and Sunday meant Whitman had one less matchup option against stacked teams like Oregon and Stanford. When Angela Zhu stepped off the field for Dartmouth on Saturday, the already depleted squad struggled to make offensive connections. For other teams, missing stars meant role players could step up and prove the roster ran deep. Without Alex Ode and Hayley Wahlroos, Oregon role players like Kaitlin Brunik, Foley Galvin, and Lillian Weaver showed they are forces teams have to contend with. Despite missing Caitlin Go and Veronica Cruz on Saturday, Stanford went 2-1 through excellent play from veterans and rookies alike. One of the most notable injuries is one suffered well before the Northwest Challenge: Dartmouth’s Jaclyn Verzuh. The rookie with ability perhaps even bigger than her enormous hype has barely taken the field for Princess Layout. Verzuh added that she’d play when she’s ready and when it’s safe, and, as is typical with injuries of this nature, was unable to provide a timetable for a return. Are Teams Saving Themselves For Nationals? After you see an elite team play force flick person defense on a dominant Oregon for ten points in a row, you have to ask: are they holding back? Last year, several teams brought new defenses to Nationals that they had purposefully not used in the regular season. The strategy helped a UBC team (sans Donaldson) play close with Oregon in the semifinal. We saw a lot of person defense from UBC this weekend, and UW’s zone during their showcase game with Oregon was effective but not show-stopping. Both teams have no doubt considered Oregon-tailored zones, but they didn’t bring them to Burlington this weekend. Holding your cards close to your chest isn’t a bad strategy, especially in a competitive Northwest region where teams know each other well. A new zone or a surprise pull play can mean a difference of three or four points if your opponent isn’t savvy. In a close bracket game, that could be all you need. Ashley, a native of Seattle, recently graduated from the University of Oregon with a degree in Journalism with an emphasis in feature writing and multimedia. She played for Oregon Fugue, winning two National Championships during her career. You can follow her on Twitter @ashleyhopeyoung. Comments on "Northwest Challenge 2016: Tournament Recap (Women’s), Presented By VC ULT Camp"